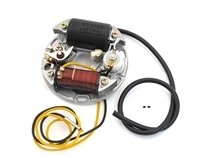 HPI CDI mini rotor ignition for all puch engines, e-50, za50, also tomos A35, tomos A55, derbi, sachs. Super curve with awesome 60w lights. Puch e50 and za50 internal rotor CDI ignition system. Should fit all Puch, Tomos, Derbi and Sachs engines. Pietcard auto retarding CDI box #2041. Works with all the Puch e50 pietcards and the Minarelli pietcard. This for sure comes with instructions so don't be scared! CDI stator plate for Puch e50 and za50, Sachs 505 and Derbi. You may have to flip the pick-up coil on the stator depending on what engine you're putting this on - no biggie! Original minarelli v1 flywheel nut. This will work on all model v1 engines and carabela too! Used bosch flywheel #0212124044 for 2 speed puch za50 engines. Super lightweight REAL 100% carbon fiber flywheel cover for any puch e50, za50, or kickstart engine. Can be made to fit other bikes as well! New Puch metal chrome fiber flywheel cover for any puch e50, za50, or kickstart engine. HPI mini electronic CDI ignition for Garelli NOI. Super bright 60w lights and curved CDI box. HPI mini electronic CDI ignition for Minarelli v1. Super bright 60w lights and curved CDI box. Magneto ignition side woodruff key for Puch e50 and za50 motors. Also for Kreidler engines. Used stator for an e50 or za50 puch engine. 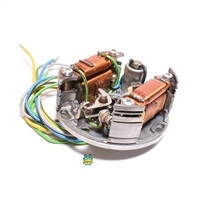 NOS 6v bosch stator for an e50 or za50 puch engine. this is a 90mm stator that can be used on batavus m48, some sachs as well! this stator has yellow, grey, green, green/black, and blue wires! theres no black.blue ground because this model is self grounding. so cool! Nylon locking flywheel nut for Puch and Derbi. These nuts do not have the flange that stock nuts have so you might want to use a washer. Replacement HPI external ignition CDI coil for all the HPI CDI units. You can also use this on any other 6v or 12v cdi unit or points ignition as well. Comes with about a foot and a half of ignition wire. tomos A55 OEM electronic ignition coil plus cdi box, get the complete package here!! this is generally found on 2003 to current models of tomos but you can use this on pretty much whatever you like. tomos part number - 233729 this is also the replacement for 234256 (discontinued) which is just this box with a wire and spark plug boot! so cool! tomos A35 OEM electronic ignition coil plus cdi box, get the complete package here!! this cdi box is found on 2003 and earlier tomos bikes generally, most a35 will have this ignition if you have CDI. perfecto upgrade for many bikes of course, the stator mounts are the same for tomos, puch, some sachs, some batavus, etc. Beautiful new old stock Carabela ignition. OEM Tomos starter motor made for A55 engines. HPI mini electronic CDI ignition for MBK av7 or av10. Super bright 60w lights and curved CDI box. HPI mini electronic CDI ignition for Morini moped engines. Super bright 60w lights and curved CDI box. Kickstart CDI nut for our MBK kickstart units. Regular right hand thread so make sure you have the right crank for it. Flywheel nut for derbi, puch and peugeot. Flywheel nut washer for derbi. Replacement HPI mini rotor flywheel for Puch, sachs, derbi and tomos HPI mini rotor ignitions. Black plastic ignition cover for MBK cdi's. Original MBK version! New old stock Jawa 210 stator plate with built in coil and wire. Not an HPI bruh. New old stock flywheel nut for minarelli p4 flywheels. You can refer to this minarelli p4 shop manual for oem part numbers and diagrams. Remanufactured Minarelli v1 and Carabela fan by Marc at M-Tech. These are urethane molded plastic 108 sized fans. Remanufactured Minarelli v1 and Carabela fan by Marc at M-Tech. These are urethane molded plastic 103 sized fans. Look here for the whole M-Tech fan set. Re-manufactured urethane molded plastic fan delete covers for Minarelli v1 engines from Marc at M-Tech. Super awesome if you're one of the badasses running a gila on your v1! These are exact copies of the original covers that came with Minarelli v1-h engines. 3 bolt pattern. Used minarelli v1 fan attachment. Tomos flywheel nut for oil injected models. Check your oil injector to make sure you need this slotted version and not the pronged version. Tomos flywheel nut for oil injected models. Check your oil injector to make sure you need this slotted version and not the slotted version. Remanufactured Minarelli v1 and Carabela fan set by Marc at M-Tech. These are urethane molded plastic parts for the 103 sized fans. They are the 3 bolt pattern base brackets amd use m6 hardware to mount to the engine. Look here if you just need the fan or the base. Remanufactured Minarelli v1 and Carabela fan base by Marc at M-Tech. These are urethane molded plastic for the 103 sized fans. They are the 3 bolt pattern base brackets and use m6 hardware to mount to the engine. Used Bosch plate with #031 on the back. Used Bosch plate with #164 on the back. Used Bosch plate with #414 on the back. Used Bosch plate with #431 on the back. Used Bosch plate with #438 on the back. Original Sachs made flywheel puller. new old stock 6v bosch flywheel! this is a 90mm flywheel that can be used on a buttload of different bikes, puch, batavus m48, some sachs, flandria, etc.